Consumer sentiment fell in March, with particular uncertainty apparent on the employment front. The gap between the number of respondents who thought jobs were plentiful and those who thought they were hard to get — known as the labor market differential — slid to its lowest level in eight months. But economists expect the US will continue to add north of 100,000 jobs each month, the amount needed to keep up with growth in the working-age population. Americans were less sure of the economy in early March and saw jobs as more difficult to get than in previous months, sparking concerns that slowing growth could hit the labor market sooner than expected. The Conference Board said Tuesday that its consumer confidence index fell to 124.1 in March from 131.4 a month earlier, with particular uncertainty apparent on the employment front. The gap between the number of respondents who thought jobs were plentiful and those who thought they were hard to get — known as the labor market differential — slid to its lowest level in eight months. Economists look at that reading as an indicator of the unemployment rate. “Confidence has been somewhat volatile over the past few months, as consumers have had to weather volatility in the financial markets, a partial government shutdown and a very weak February jobs report,” said Lynn Franco, senior director of economic indicators at the Conference Board. In February, the economy added the fewest jobs since September 2017. The 20,000 increase missed expectations by a long shot and raised questions about whether the results signaled month-to-month noise or the start of a downward trend. 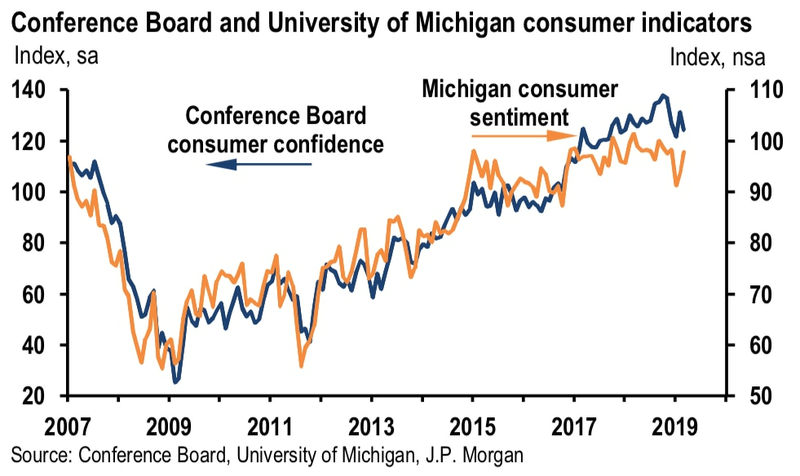 Overall consumer confidence trends have been slowing over the past year, as the initial effects of tax cuts fade and global trade tensions continue. The Federal Reserve dimmed its growth forecast for the US last week, also citing reduced activity in China and the European Union. Still, consumers remain confident that the economy will continue expanding in the near term. Economists predict that while the number of jobs added each month will slow, growth will remain above the 100,000 increase needed to keep up with the working-age population.